Technical Thursdays - Brace Yourself for a Very Boring Article! Workshop Wednesdays - Epoxy for Furniture? 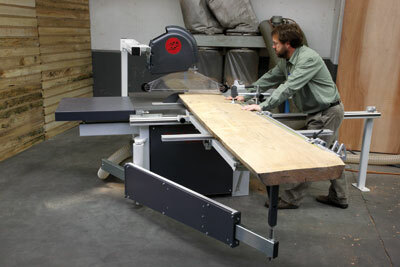 This Belgian giant of a tablesaw comes with a 7.5hp motor or, if that's not enough, you can upgrade your order to 10hp! 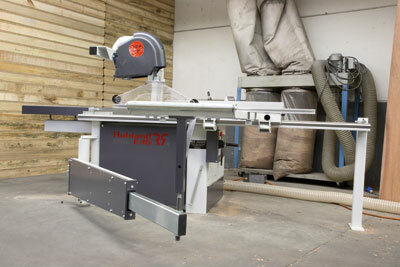 While I have nothing like enough space in my workshop for a machine this size, I was keen to take the chance to see what it could do and make comparisons with features and capabilities of smaller saws. Robland have been restyling many of their machines lately, but not this one - the basic model was designed a long time ago and it has been improved over the intervening years. The E45 is an unremarkable-looking steel construction with a massive cast-iron table and alloy fences. With its grey casing and barely visible logo you probably wouldn't notice it at a woodworking show. What I really liked is that it is built like a bomb shelter - the all-up weight is 3/4 of a tonne, enough to provide serious rigidity and stability when you need to cut a lot of heavy timber. Unlike panel saws which have a lightweight sliding table running alongside the blade, the E45's 450mm-diameter TCT blade protrudes though an opening in the 1150 x 965mm cast-iron table with a well-fitted alloy throat-plate around it. I was disappointed to see some rust spots on the blade I tested - nothing to worry about but not what you would expect on a new machine. 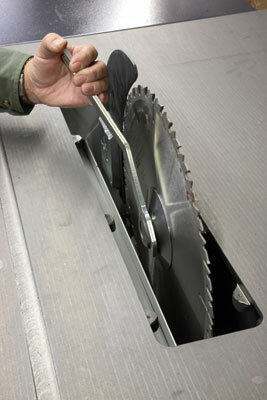 This saw will cut 150mm-thick timber vertically or 120mm at 45 degrees - more than enough for most makers. Rise-and-fall and tilt are controlled from separate hand wheels conveniently mounted side by side along with the stop/start switchgear on the front panel. The overhead saw-guard is mounted on a long arm which carries the overhead extraction hose through a large plastic moulding. This arrangement works well enough but looks rather cumbersome. Changing blades is easy with the locking pin inserted and a standard wrench on the 30mm tilting arbor. A 350mm sawblade can be fitted as the smallest size with the standard riving knife but smaller blades and knifes are available should you need them. With the throat-plate removed there is good access to the nut on the 30mm arbor or to adjust the riving knife. 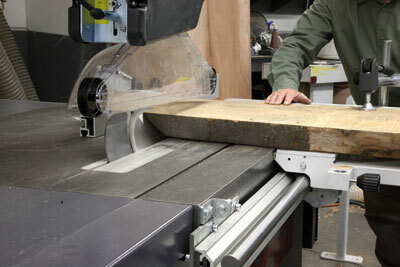 The riving knife is well shaped, with a chamfered front edge to avoid snagging inside the kerf. 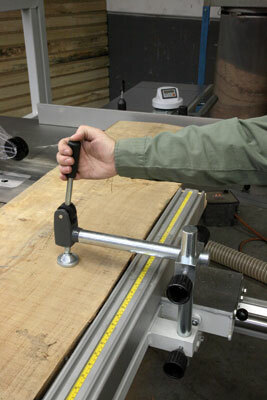 The overall size of the sliding table is 1510 x 510mm. 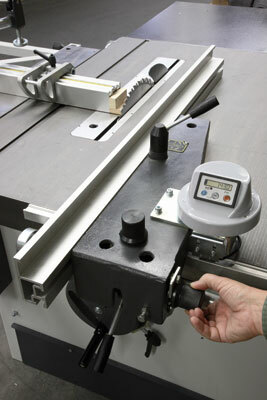 The inboard side of the table slides on a conventional 30mm-diameter steel guide rail for crosscutting. This rail projects more than a metre in front of the machine with a support leg for extra stability, giving the saw a stroke of 1270mm. The far end of the outrigger is supported on a telescopic sliding arm with a massive hinge attaching it to the main frame. This gives massive strength to the cantilever where you need it. 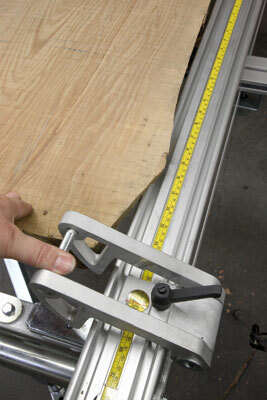 Double flip-over stops are provided on the outrigger and these are calibrated both in millimetres and sixteenths of an inch, enabling you to make accurate repeatable crosscuts on large sections of timber. Digital flip-stops are also available. The rip fence runs on a steel guide rail similar to the crosscut rail, but this one is 50mm diameter, giving the fence incredible rigidity. An optional digital position indicator uses a magnetic sensor, capable of resolving the fence position to within 0.1 of a millimetre. Everything about the rail and the adjustment system is solidly engineered and I would have confidence in them maintaining excellent accuracy, even after hard use. The E45 runs up to speed swiftly and quietly, producing a noise level under load of 91 decibels. There is no discernible vibration, as you might expect from a machine with such a solid construction. 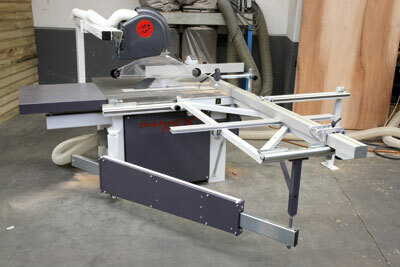 This is definitely a saw for the workshop blessed with a luxury we don't have too much of in Britain - plenty of space. Your workshop will need to clear more than 3.5m in each direction just to fit the E45 in, plus of course you will need significant working room all around. 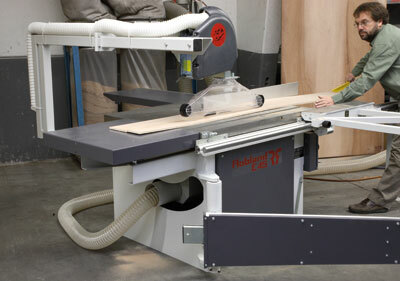 It has to be said that the E45 is not the most elegant-looking piece of machinery to come out of the Belgian factory, but if you see through the lack of styling, the build quality is excellent and the utility of the design incorporates all that Robland has learnt in decades of making tablesaws. Obviously price is always a factor and particularly in these times of economic chaos, but looking at the quality of construction, if you need a heavy-duty saw its size represents excellent value for money. When I tested the E45 before Christmas it was selling for under £5,000 including VAT, which seems excellent value, but exchange rates are all over the place these days. You would be best to check with a supplier before making any decisions - at the time of writing RJ Machinery was offering it for £3,392.50 inc. VAT. The price of the Robland E45, while not trivial, is a fraction of the value of the building area it would occupy. "The build quality is excellent"